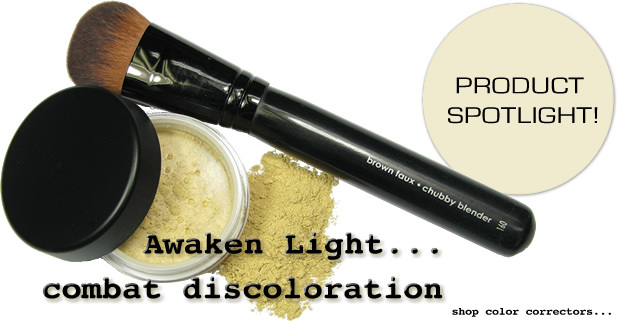 Product Spotlight - Awaken Light! Formulated specifically for skin that needs a little extra help, Buff'd Color Correctors help conceal discoloration from acne, scarring, rosacea and age spots. Our Awaken shades will hide under-eye circles and help smooth out skin tone discoloration and redness. A light dusting applied under your foundation, these feather-light powders will brighten tired, irritated and sallow skin leaving a spectacularly flawless complexion. Available in Soft, Pale, Light, Medium Light, Medium and Medium Dark. For best results order one shade lighter than your foundation. For example if you use Beige - Medium Light Foundation try Awaken Light. For a limited time enjoy special pricing on all Awaken shades.